Looking for a noodle dish loaded with spicy flavor and easy to prepare on a weeknight? 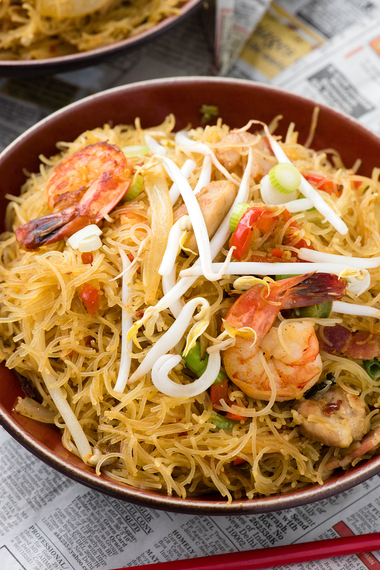 Singapore Street Noodles is a sure bet. I had the pleasure of living in Singapore as well as traveling there many times on business. I fell head over heels in love with the food. When I was living there, Singapore was divided equally between Chinese, Indian and Malaysian cultures all of which blended into a rich and exciting food culture. Despite all of the noodle dishes I grew to love, Singapore street noodles was NOT one of them! There were many noodle dishes that became my regulars. We’d have them for breakfast in spicy broths, as well as lunch or at the local hawker centers (food courts) for dinner where I’d go nightly with my work colleagues. Before I returned to the U.S., Singaporean and American friends would ask me what food I was craving most from home. Honestly there weren’t any since there were a number of larger American chains in Singapore. What I would miss greatly was the local ethnic cuisine, much of which was not available outside Singapore. The reason I had not become smitten with Singapore Street Noodles is that it is not a Singaporean recipe! It makes them no less delicious but places them in the ranks of foods like French fries which originate in Belgium, not France. I traveled down several rabbit holes looking for the basis of what is known as Singapore Street Noodles, and my conclusion is that it’s a dish originating in Hong Kong. 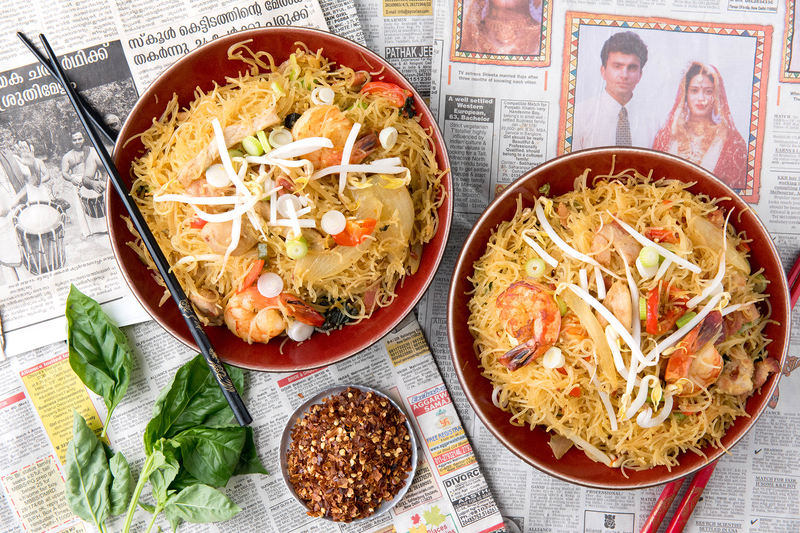 Though similar to two particular true Singaporean noodle recipes, this recipe has taken on characteristics of its own. For instance, the addition of the curry. I read a very long conversation thread online started by someone wishing to have traditional Singaporean Street Noodles on an upcoming trip to Singapore. The locals were chiming in about the noodle dish and how they never serve such a dish with curry in it. I think, as with many favorite foods, versions of Singapore Street Noodles have transformed over time. Some versions have shrimp and chicken, some shrimp and pork; some only one of those meats. Some have curry. Some are spicy. They all use rice noodles (which are naturally gluten-free) and stir fry as the means to combine the flavors in the dish. I too have created my own version, staying true to the basics of what we know as Singapore Street Noodles in the U.S., adding some of what I love about similar noodle recipes from Singapore. It’s a spicy combination of chicken, lean pork, shrimp with a bit bacon for a flavor similar to Chinese barbecue pork. There are sultry spices and some crunch too. The recipe makes a very large batch however vermicelli rice noodles tend to be less filling allowing the diner to eat more to make a meal! What a delicious fate. 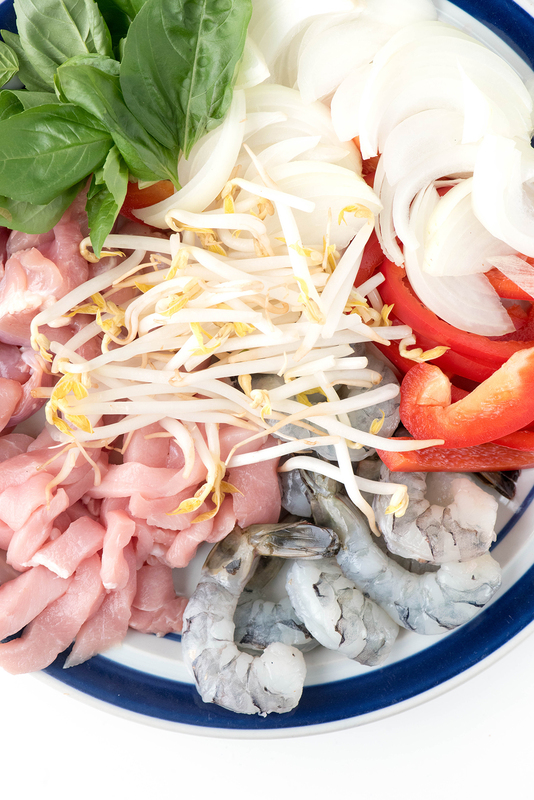 One quick tip about stir fry cooking: have all of your ingredients prepared beforehand and at the ready. It’s a fast cooking process allowing everything to retain a great texture, color and flavor. There is no time however to prepare anything during the cooking time. Get the Singapore Street Noodles recipe!